Controlled explosion. With convincing components and slim cases, the notebooks from Acer's new Aspire V Nitro-series are real all-rounders for discerning customers. Our Black Edition with the GeForce GTX 860M is targeted at gamers. Our review shows whether the performance, temperatures and maintainability can meet the expectations. 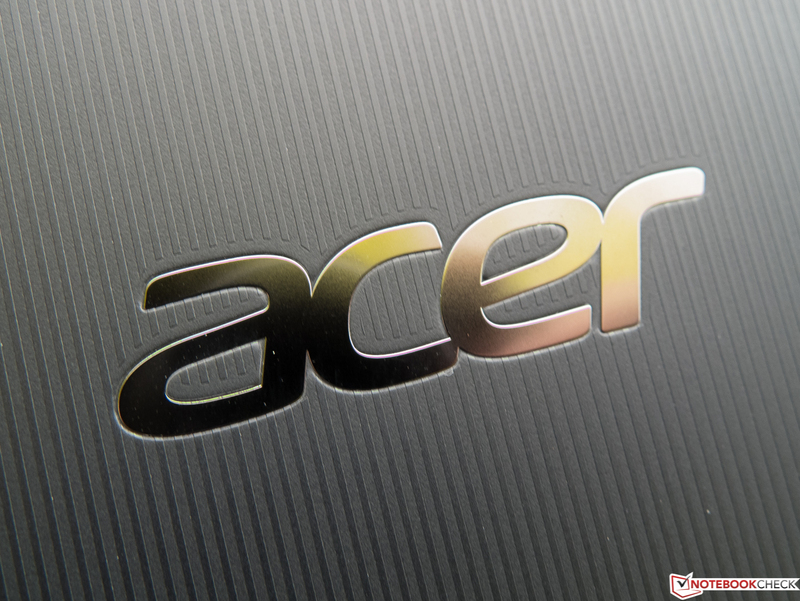 Acer does not define a special group of customers for the Nitro-series. 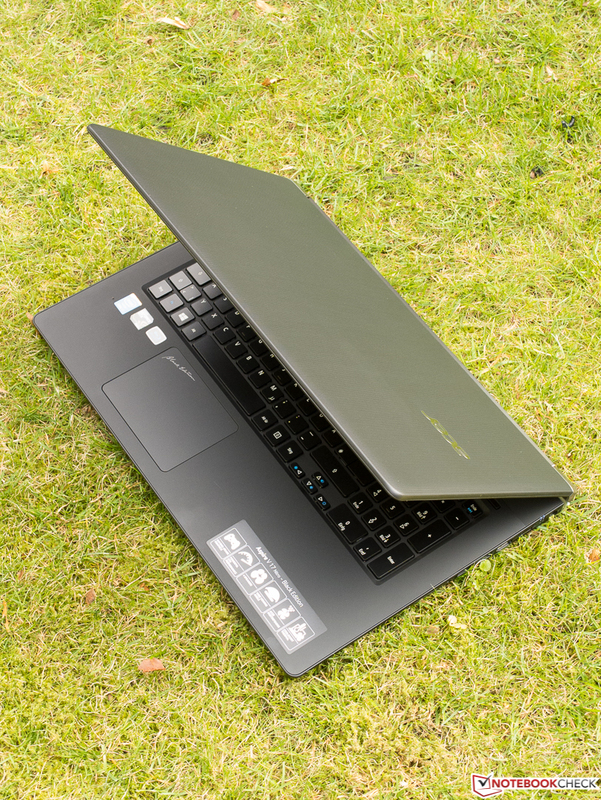 Our review unit has a 17.3-inch display, weighs about 3 kilograms (~6.6 lb), and is a perfect gaming notebook with a fast high-end GPU Nvidia GeForce GTX 860M (2 GB GDDR5) and the quad-core CPU Intel Core i7-4710HQ (4x 2.5-3.5 GHz, Hyperthreading, TDP 47 W). It will probably be used as a stationary desktop replacement most of the time and should also be powerful enough for any other tasks besides gaming. The Aspire V Nitro-series consists of multiple devices in 15 and 17 inches with differences in terms of CPU, RAM, graphics card and storage solutions. 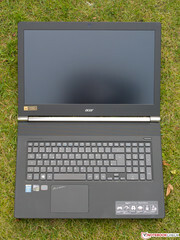 An overview about the various versions and comparisons can be found on the corresponding website from Acer. Gamers usually know what they want from their gaming machines in terms of size and performance. 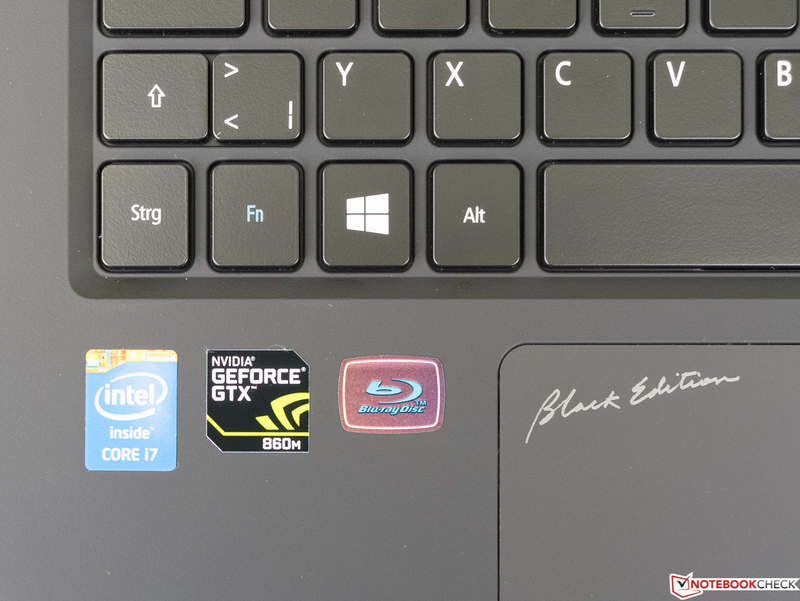 Therefore, we selected two notebooks as comparison devices with (almost) identical processors and graphics cards and 2 GB GDDR5 memory each, which is also used in our Aspire VN7-791G-759Q. First there is the recently reviewed Medion Erazer X7613-MD98795 (Intel Core i7-4710HQ, 16 GB RAM, Kepler GPU), which, just like the review unit and the third comparison device Gigabyte P27G v2 (Intel Core i7-4710MQ, 8 GB RAM, Maxwell GPU), is equipped with a matte Full HD display. 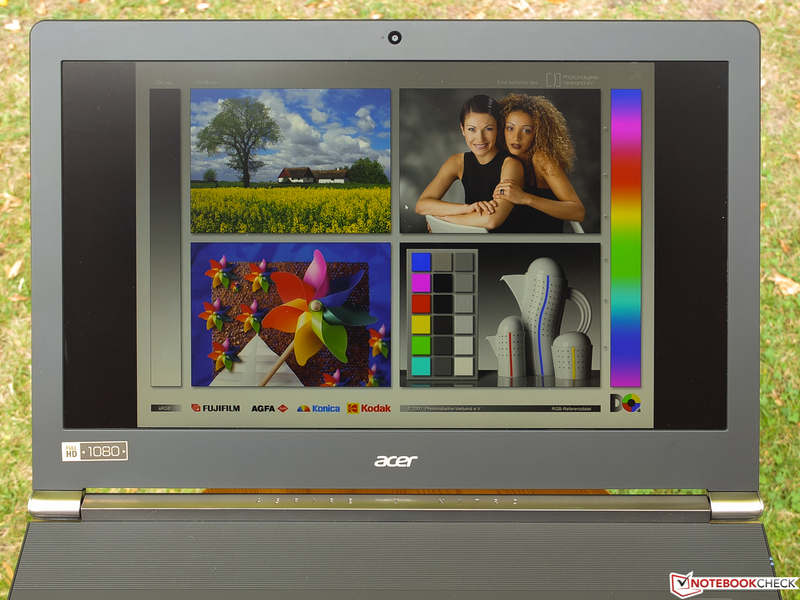 Acer uses the more expensive and superior IPS technology, while the two competitors have TN panels. All three manufacturers decided to integrate a combination of 128 GB SSD and a conventional hard drive. There are differences with regard to the cases and the weight: The Medion, with a height of just 23 mm (~0.9 inches), and our Acer Nitro (25.4 mm; 1 inch) want to convince with their slim construction, but the former weighs 300 grams (~0.66 lb) less. Gigabyte follows the traditional concept and uses a much larger case with a maximum height of 49 mm (~1.93 inches), but the P27G v2 still weighs just 130 grams (~0.29 lb) more than the Acer VN7. Gigabyte and Acer cost around 1,200 Euros (~$1528) at the time of writing. The Medion is about 150 Euros (~$191) more expensive. 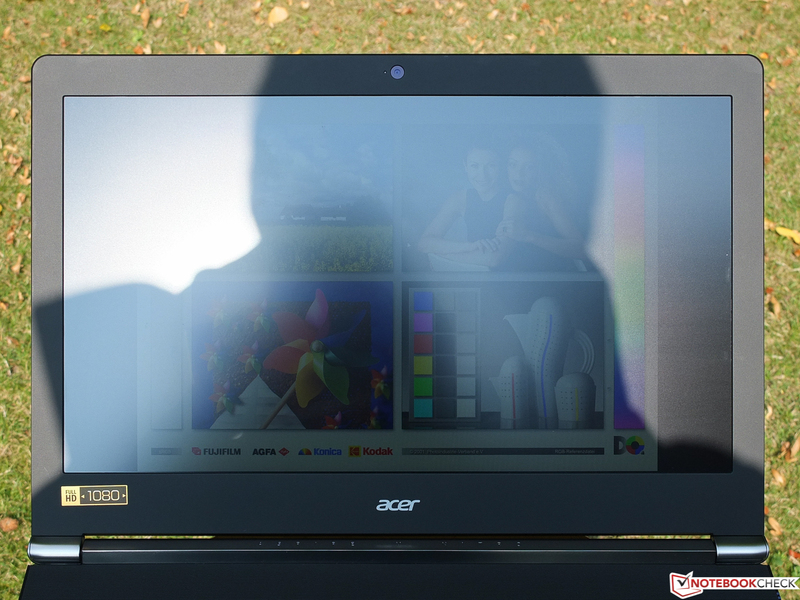 This is a nice surprise: You can see that Acer has put a lot of thought into the design of the VN7-791G-759Q. In our opinion, the result is a successful combination of sophisticated looking materials, interesting surfaces that are nice to touch, a clear design and subtle visual accents like the silver area around the hinge with the fan vents at the back or the red illuminated keyboard. The dominant color is black, which should meet the taste of the target group. Palm rest and the area around the keyboard have a matte surface with a velvet feeling that does not attract fingerprints at first, but you will see them eventually. In front of the hinge is a 4.5 cm (~1.77 inches) wide area with fluting. The display frame and the non-slip base are made of simple matte plastic. A special feature is the pressure resistant display cover, consisting of the so-called soft-touch NIL, left a very good impression. Not quite as spectacular is the stability of the case, it was possible to twist the base unit with some force, but there were no creaking sounds. 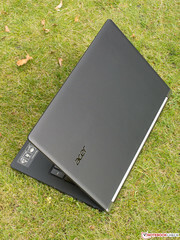 Acer does not disappoint in terms of build quality: We cannot find any protruding parts, rough corners or uneven gaps. It is still possible to open the lid with one hand without lifting the base unit. Sudden movements, for example, in the car or on a train ride, resulted in a significant bouncing of the display for a couple of seconds. This is tolerable since the usage scenario is not very likely. 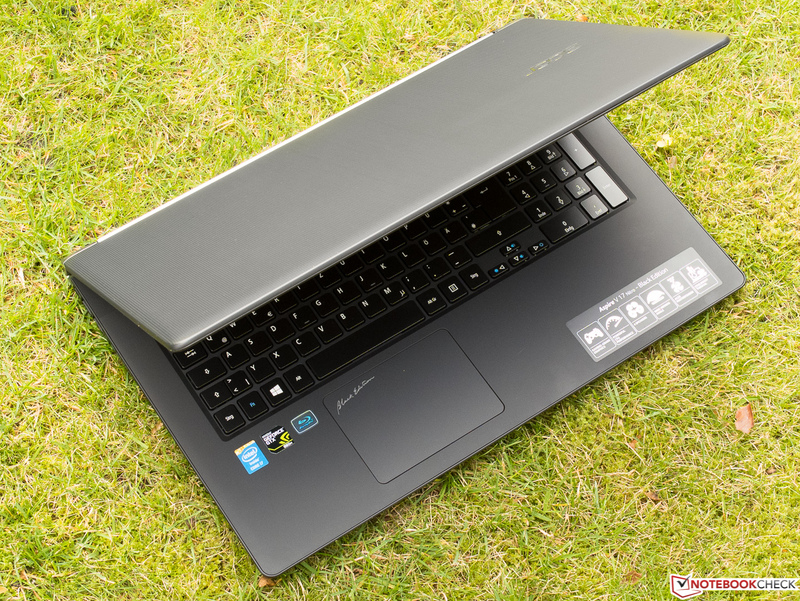 Slim gaming notebooks like our review unit were not possible a couple of years ago, but now you get these devices from several manufacturers like MSI, Gigabyte and Schenker. 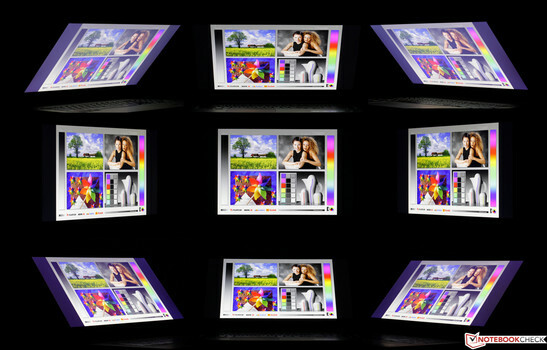 Intel's initiative to develop very small components for ultrabooks made this possible. However, you often have to deal with thermal issues in return and therefore higher system noise from the fans as well as a possible throttling of the CPU and sometimes GPU performance due to high temperatures. 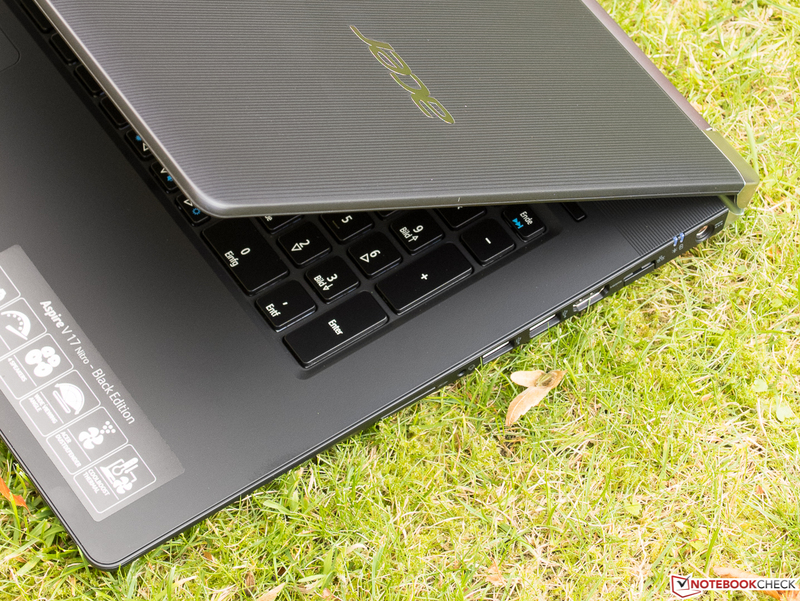 Since the launch of the first ultrabooks, manufacturers have followed the trend to waive maintenance covers or replaceable parts such as the battery, which is not really environmentally friendly. This is obviously an advantage for the manufacturers because they usually can charge expensive maintenance fees if you have to maintain the notebook. 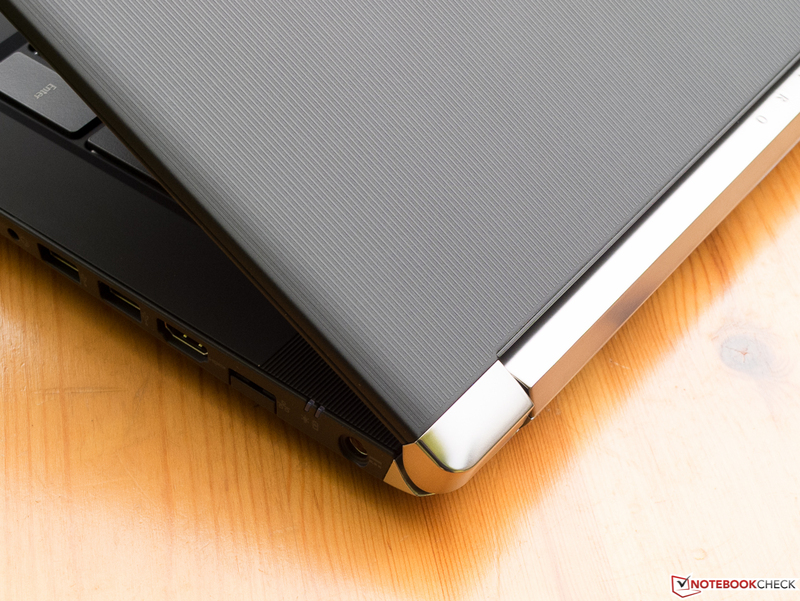 Our Acer Aspire Nitro suffers from the same problem, which affects the otherwise good impression of the case. You won't find any special ports like eSATA or Thunderbolt, but from experience, we can say that this will hardly be an issue for gamers. The port variety is pretty much standard with 2x USB 2.0 and 2x USB 3.0, which is very helpful when you use the notebooks on your desk. Very convenient is the port layout, all the ports are at the rear area of the notebook where attached cables and devices like USB sticks won't be disturbing. The transfer rate of a large file form an external USB 3.0 hard drive to the integrated SSD was around 100 MB/s, which is similar to most current notebooks. 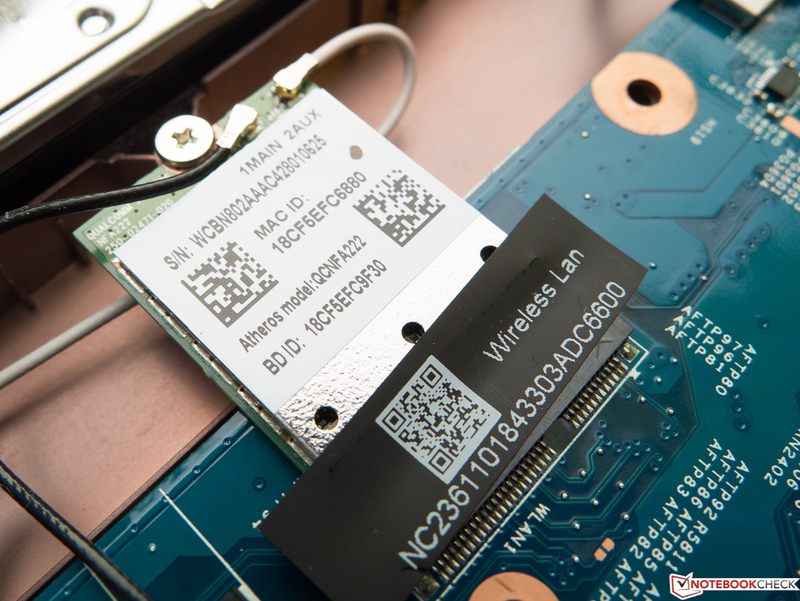 The WLAN module Atheros AR5BWB222 does not support Gigabit WLAN, but works with the less crowded 5 GHz networks and the usually flooded 2.4 GHz networks. This is always an advantage if there are many wireless networks in one area, for example, in office buildings or metropolitan areas in general. First, we check if there are issues with the transfer rate in the individual setup of the author with a distance of around eight meters (~26.3 feet) and two walls between the device and the router, but that was not the case. 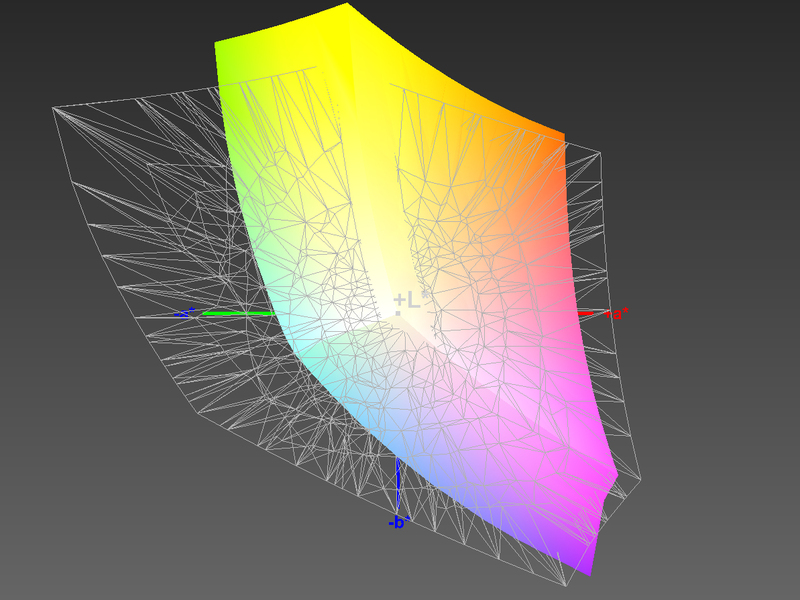 Next, we decrease the distance to the router while we add structural barriers like a stairwell. The signal quality was average in this case. There should only be issues if you have a very low signal quality. 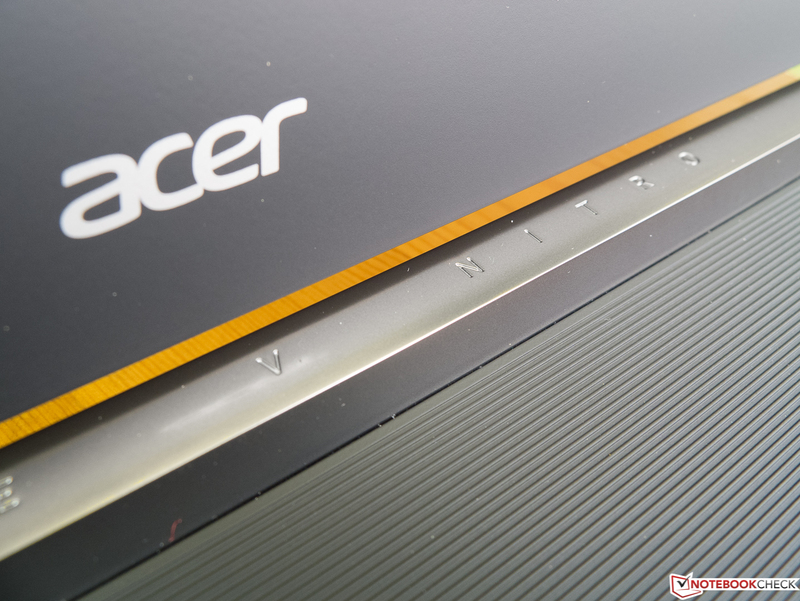 Acer did not offer any dedicated accessories for the Aspire V Nitro-series at the time of this review. Except for the power adaptor, there is nothing in the box. Instead of installation DVDs you get a recovery partition, which should be left untouched. We have already mentioned that there is no maintenance cover, and it makes it tricky to access the battery. The cover of the base unit goes up to the edge of the device. 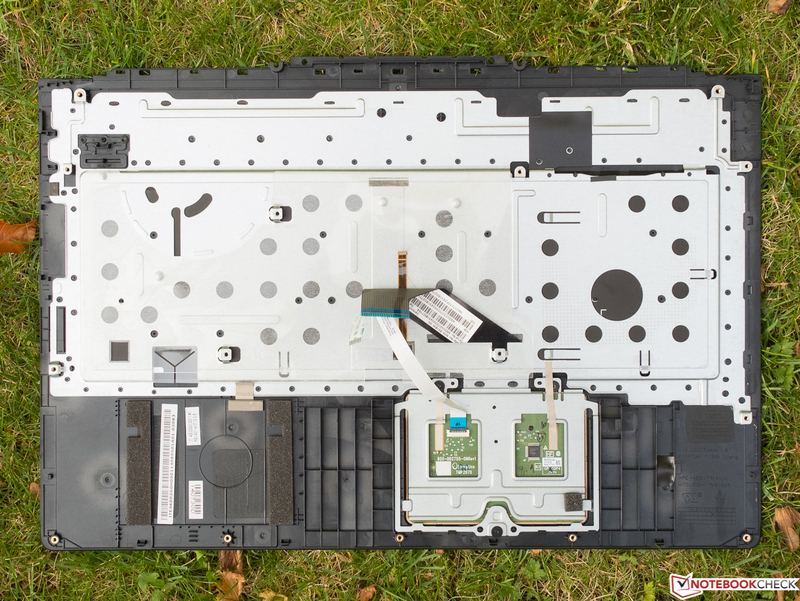 According to Acer's support, you can lift the top of the base unit with the keyboard and the touchpad after you loosened two long screws and 13 short screws at the bottom. We recommend you use a special tool to lift the top since there can be damages when you use a knife or a screwdriver. We were able to open the device after some fiddling, but we still had to disconnect three short cables to the keyboard for free access to the components. You can see the results in the pictures on the right side of the article. 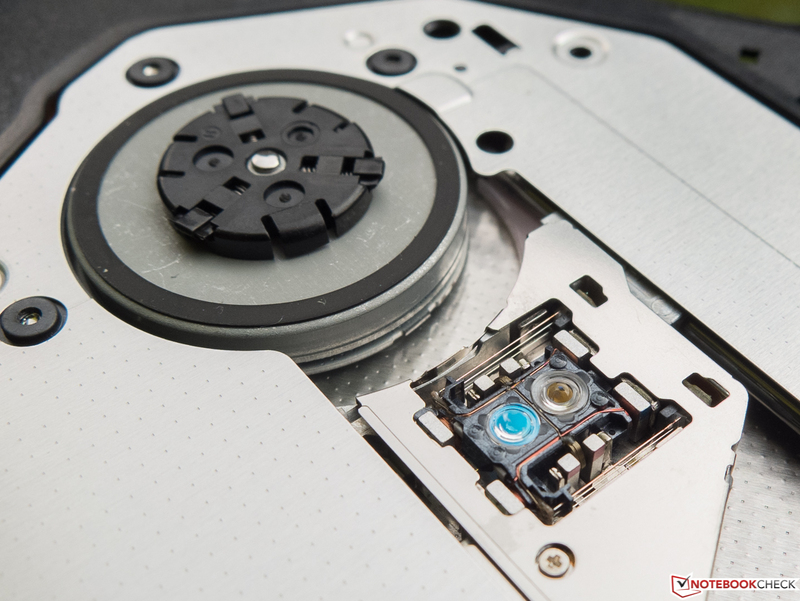 The hard drive is secured by screws, but the battery also seems to be glued, and you have to loosen additional screws to get to the memory slots. We abandoned the last step, but at least you could access the fan and the WLAN module. The author had massive problems to reconnect the keyboard cables due to the limited space. 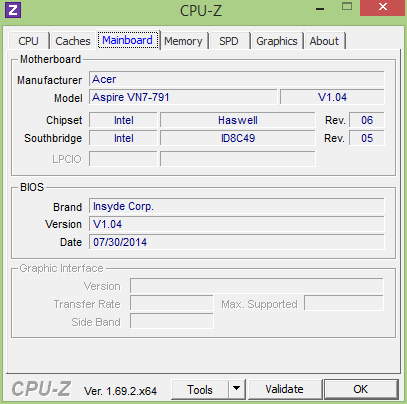 All in all, the poor maintainability is a real issue for a gaming notebook. The Acer Dust Defender does not improve the situation, either. This system reverses the air flow periodically, which is supposed to avoid dust deposits. 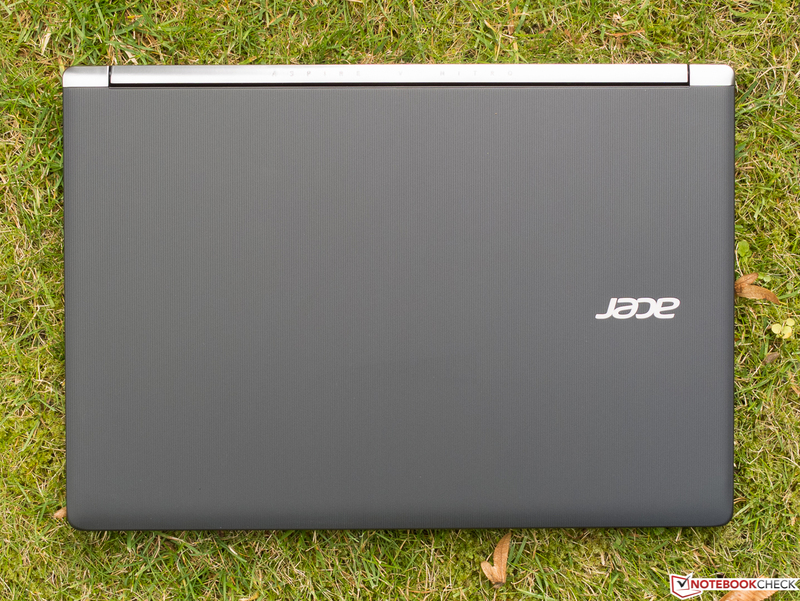 The overview page of Acer's standard warranty lists a 2-year warranty with the addition of a one year "International Travelers Warranty". The layout of the flat keys with an anti-slip coating meets the usual standard and does not offer any surprises. 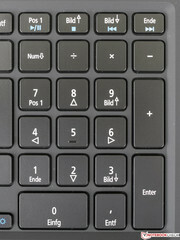 Even though the width of the main area is identical to usual desktop keyboards, Ctrl, Alt and Alt-Gr keys only have the size of a regular key. 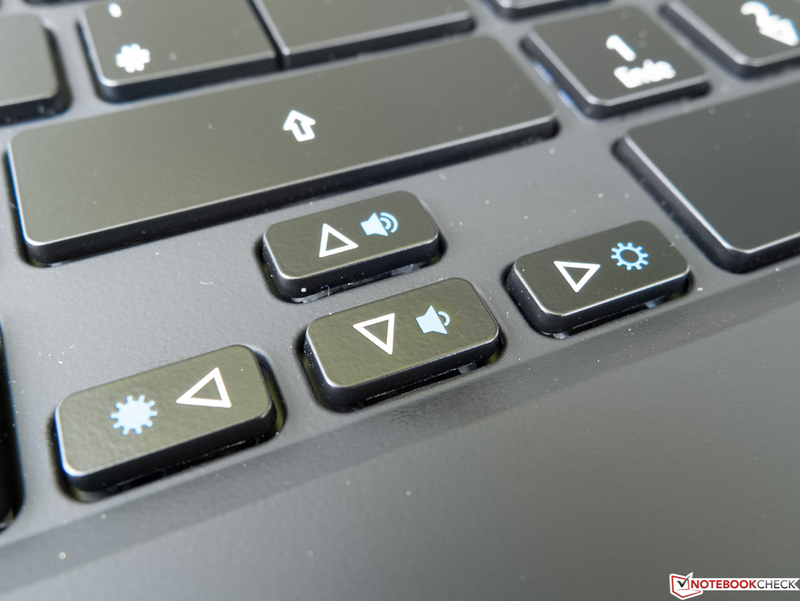 The arrow buttons, which can be used to control the volume and display brightness via FN key, are only half-sized. We noticed slight flexing around the "Ä" button during normal use. It was not annoying in practice, but the stability did not leave the best impression. You can expect more travel from a 17-inch device than from a 2 cm (~0.79 inches) slim ultrabook, and this is the case here. The pressure point is clearly perceptible and the stroke is quite hard. The typing noise of the small keys is very subtle, the noise of the larger ones not so much. 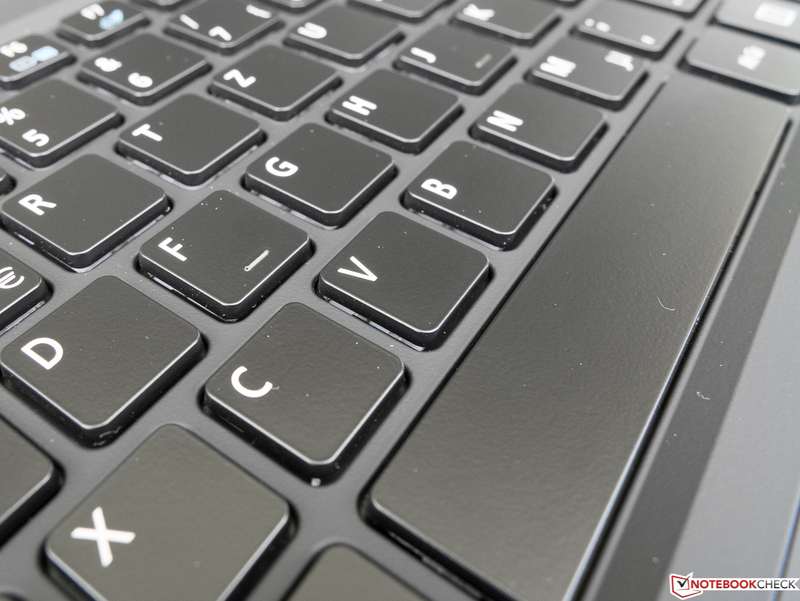 Using the keyboard in noise-sensitive areas is not possible because of the clattering space bar – what a shame. One highlight of the keyboard is its red illumination, which shines through the apparently hovering keys and lightens up the lettering. However, you cannot adjust the illumination, but it is subjectively very convenient and well adjusted. 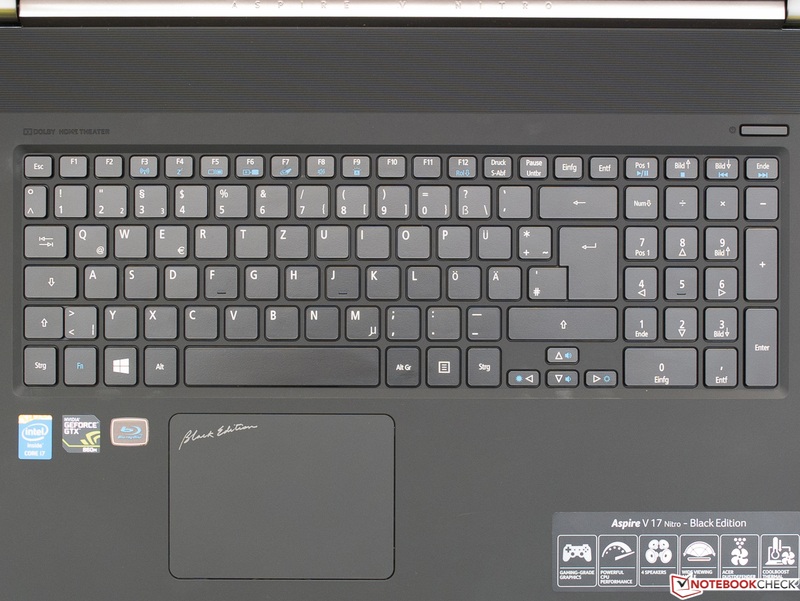 Typing on the keyboard of the Acer Aspire V 17 Nitro was no problem. 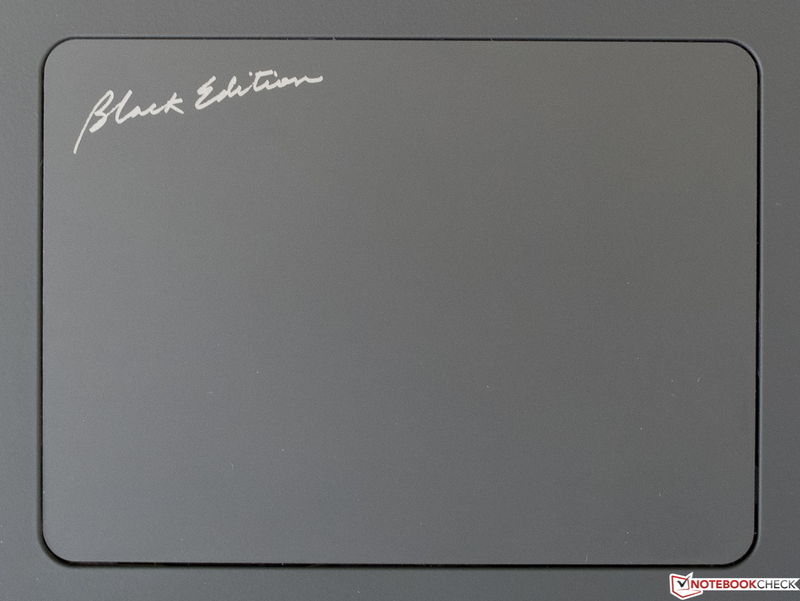 Acer decided to use a large ClickPad without dedicated buttons. The slightly roughened surface provides a haptic feedback. It is touch-sensitive up into the peripheral areas and leaves a perfect impression in terms of response and precision. Even very fast movements are recognized without problems, double taps to open a folder or launch an application worked just as well as double taps and holding for drag & drop. You can press the whole touchpad area down, which is recognized as a left click except for the lower right corner. The mouse buttons have a small travel, a firm pressure point and a clearly audible feedback. We think it could have a more central position because you might touch the pad with your wrist when you use the gaming-specific WASD keys. This is obviously no problem if you remember to disable it via hotkey before you start playing. The notebook (still) uses the standard Windows driver, so the configurability is limited. 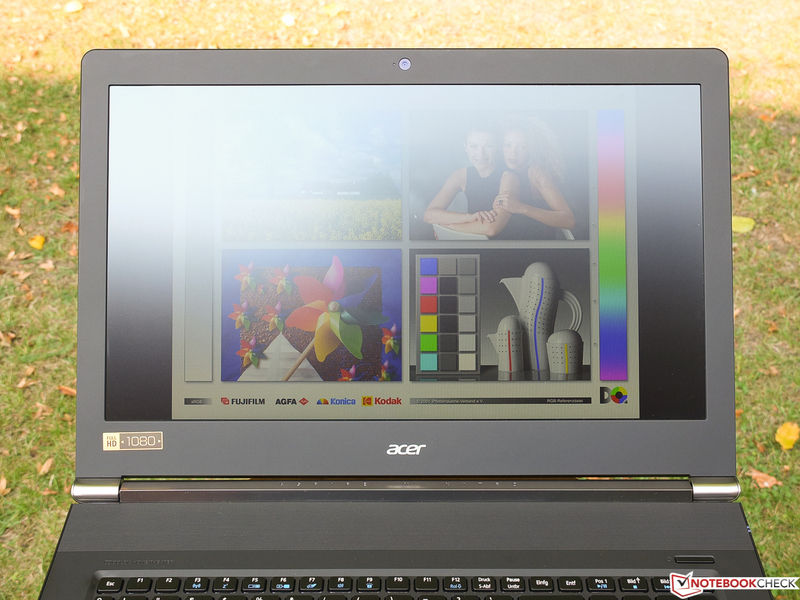 Unlike the other two comparison devices in this review, the Acer Aspire Nitro is equipped with a high-quality IPS panel, which has advantages over the cheaper TN versions in terms of viewing angle stability and color presentation. The Full HD resolution (16:9) is perfect for gaming and avoids scaling issues, which can still be an issue with the increasingly popular higher resolutions. The pixel density of the Nitro is 127 ppi, and not really contemporary. If you are dealing with such high brightness, you also need high contrast for a good black value. However, we can only measure a contrast of 559:1, which is just good, but also results in a high black value of 0.59 cd/m². This means a completely black picture (RGB 0,0,0) is too bright in practice. As you can see in the chart, the review sample is not even close to the two comparison devices with their excellent results in these two disciplines. Fonts are always razor-sharp, no matter what the colors are. In factory settings, the DeltaE deviation of our review sample, which describes the color accuracy, is 8. This is not a great result for an IPS display, but still okay. The resulting blue cast is gone after a calibration, the DeltaE is reduced to 2 (grayscale) and 4 (ColorChecker), respectively. The available color space coverage is only important for (semi) professional users. 59% of the large AdobeRGB color space (80% sRGB) are less spectacular for an IPS display than the surprisingly good 54 and 55% from the TN panels of the Medion and Gigabyte. Less than 40% is not uncommon for cheap TN panels. The matte display surface and the high maximum brightness are a good combination when using the device outdoors on a sunny day if you can find a suitable position. The pictures below show that once again this depends on the correct angle in relation to bright areas and the sun. 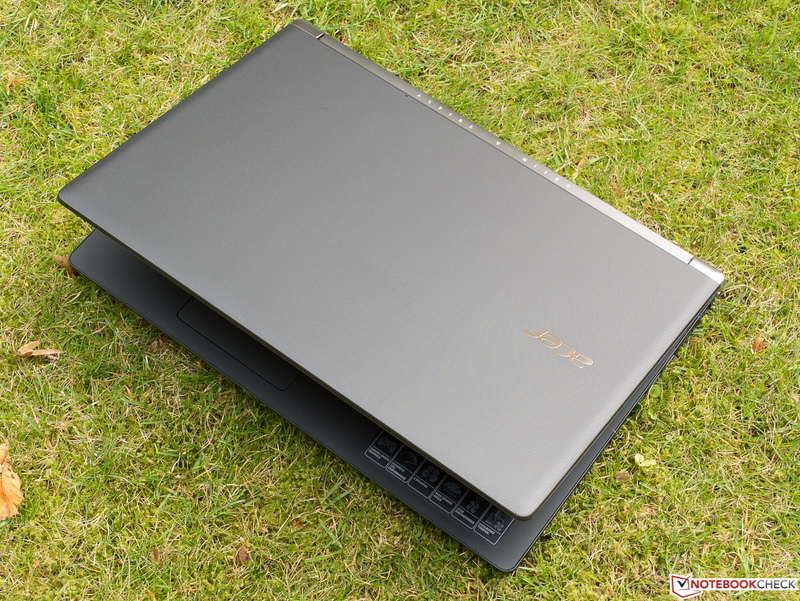 Amongst others, the IPS technology is supposed to ensure wide viewing angles, which works well in the case of the Acer Aspire Nitro V 17 Black Edition. The picture remains pretty stable with horizontal and vertical shifts of the viewing position; you will only notice minor brightness and contrast reductions. It is a different situation if you look at the display from an angle above, in this case you can see small picture distortions that are similar to TN panels including distorted colors and a milky veil. The LG-Philips display did not cause any troubles during daily work practice. The viewing angle stability is convincing for the most part. 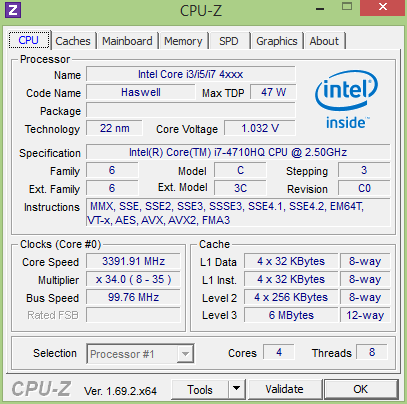 The four cores of the fast Haswell quad-core Intel Core i7-4710HQ are clocked at 2.5 up to 3.5 GHz. 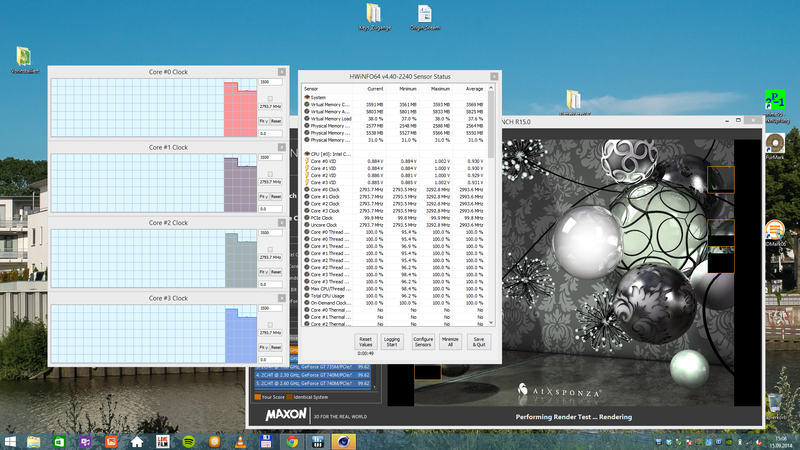 The limit for two active cores is 3.4 GHz and 3.3 GHz when you stress all four cores. 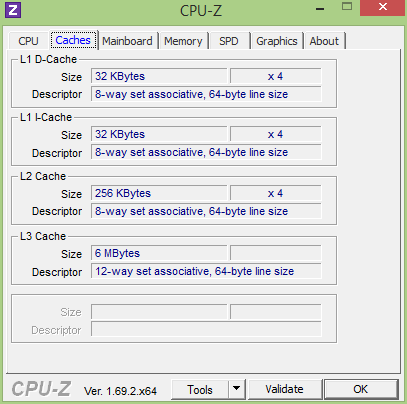 The maximum Turbo of 3.5 GHz can be used for a short time if the CPU executes only one thread; thanks to Hyperthreading it can execute up to eight threads simultaneously. 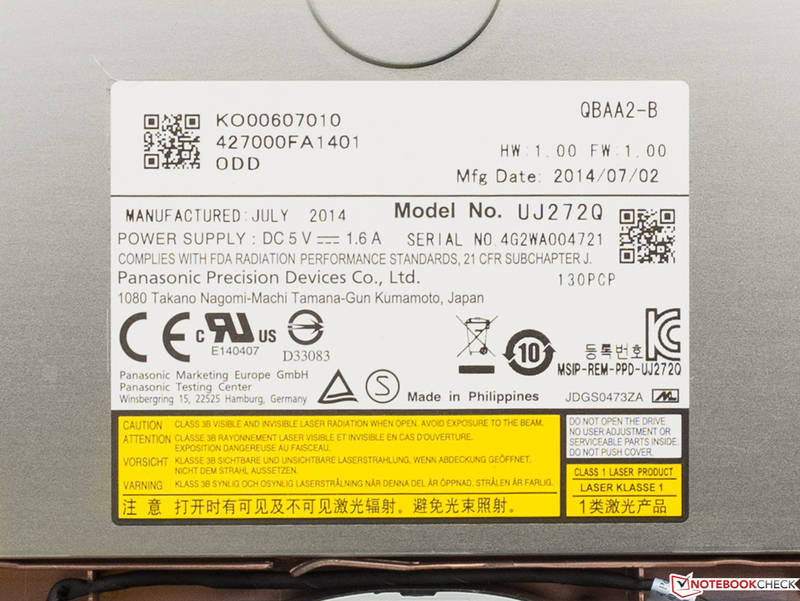 Unlike the i7-4710MQ, which runs inside the P27G v2, the HQ in our review unit is soldered onto the mainboard, otherwise there are no significant differences. Because of the comparatively high TDP of 47 Watts, the CPU is only suited for larger laptops with at least 15 inches. Integrated is the frugal graphics solution Intel HD 4600, which is automatically used for less demanding calculations like 2D rendering via Optimus technology. In terms of performance, the i7-4710HQ has no problems with complex tasks and has an advantage as soon as software like 3D rendering applications can utilize its eight virtual and four native cores. But the single-core performance compared to Ivy Bridge processors is 5 to 10% higher (per MHz performance) thanks to the higher clocks. 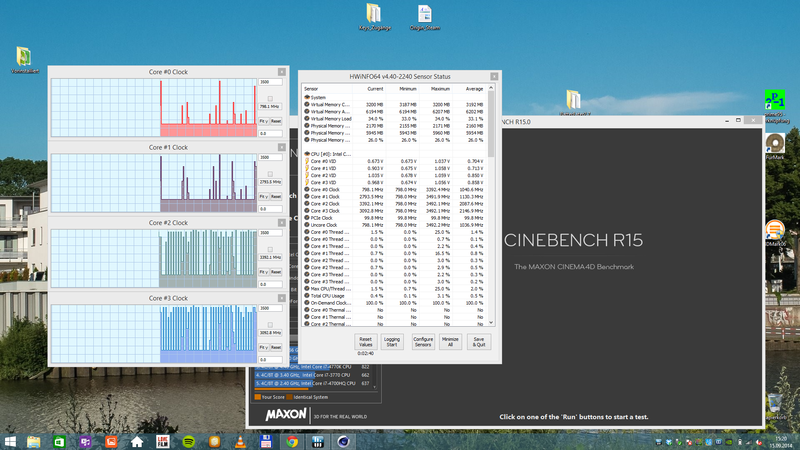 The CPU can utilize its Turbo Boost potential perfectly under realistic stress for the CPU like a Cinebench run. 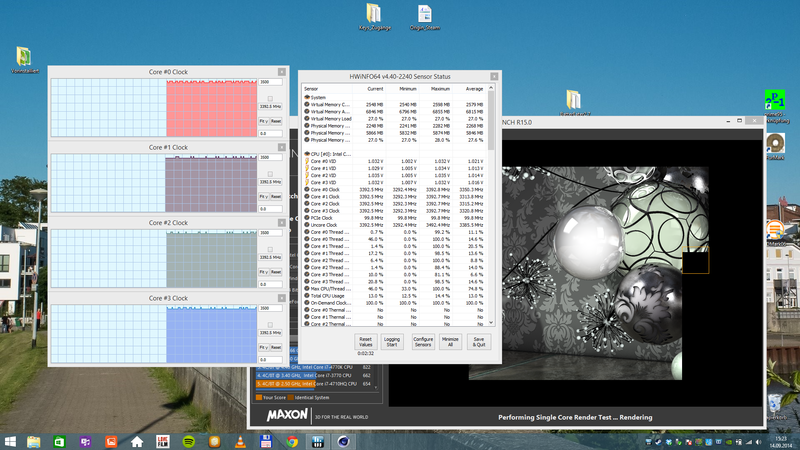 You can see on the screenshot that the specified maximum clock of 3.3 GHz can be maintained for all cores during the Cinebench R15 Multi-Core benchmark. The clocks drop to 2.8 GHz on battery power, but that is not surprising. 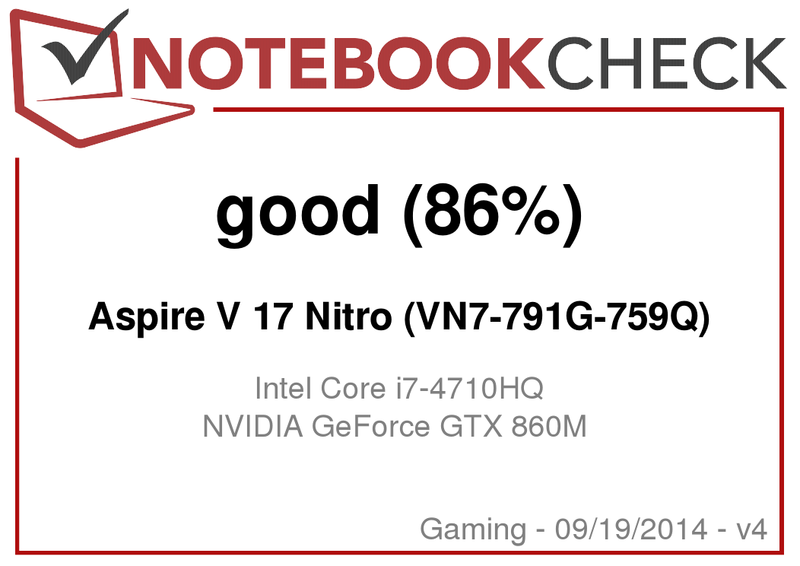 If you compare all the reviewed gaming notebooks with this processor in the last 12 months, the review unit and the Medion Erazer X7613-MD98795 manage the best result with 7.13 points, while it falls by up to 20% behind the fastest notebooks in the single-core benchmarks and can only take a spot at the bottom within the comparison. Many benchmarks for mobile processors with comprehensive filter options are available in our FAQ section. 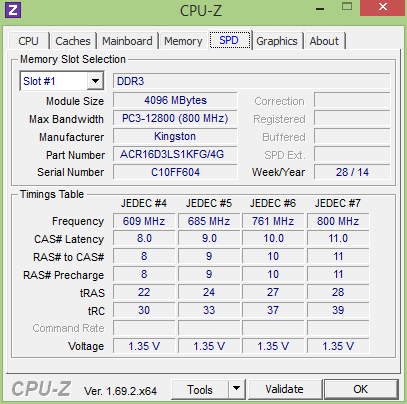 We use PCMark 8 and PCMark 7 to evaluate the system performance, including the storage solution and graphics card. The overall score is on the expected high level and comparable to similarly equipped devices. 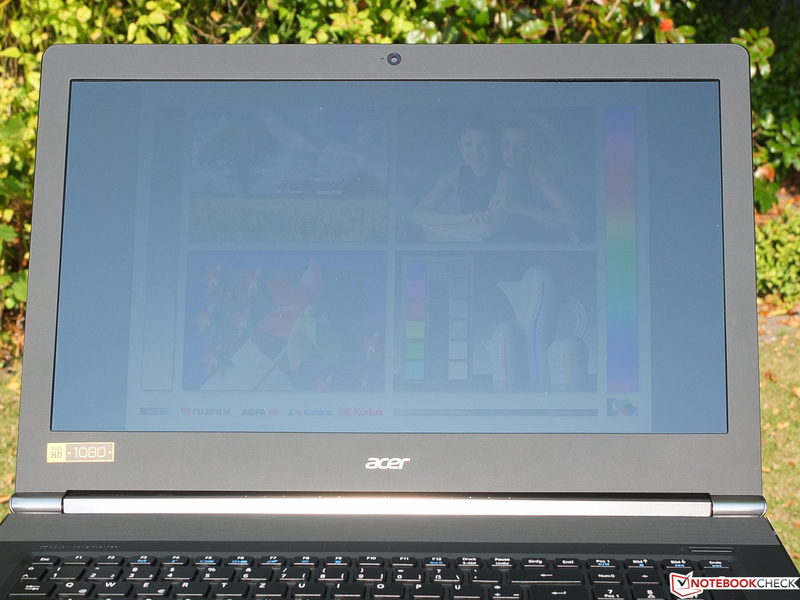 The same applies to the individual disciplines of PCMark 8, although the Acer Aspire VN7-791G-759Q can manage a small lead over the two comparison notebooks. With regard to the subjective performance, we can only say that it could not be better. The system reacted very quickly in every situation, there were no delays during web browsing or file transfers even during the stress test with Prime95 and FurMark (more on that later). 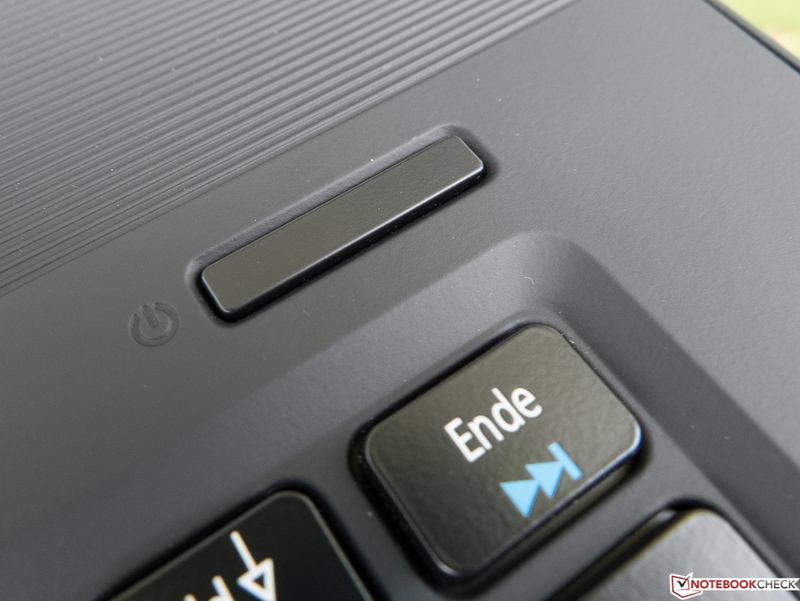 The time between pressing the On/Off button and the appearance of the desktop (cold start, no hybrid standby mode) is less than six seconds, and the majority of applications just launched instantly, so the handling is a joy. 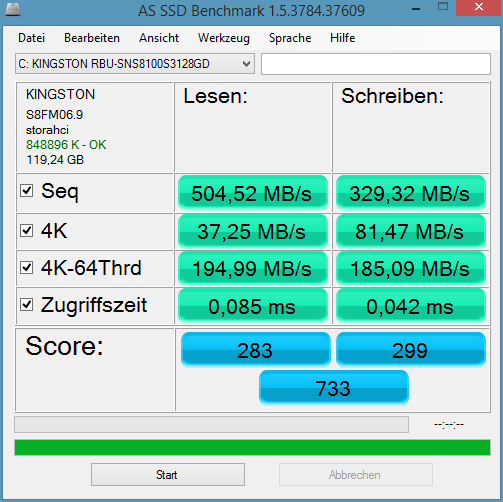 Compared to other current SSDs, the drive in the Aspire Nitro does an excellent job. 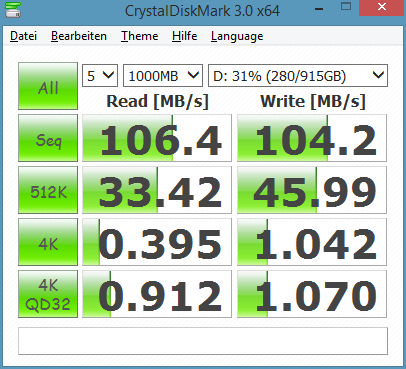 It starts with the transfer rates (sequential read) in CrystalDiskMark 3.0 that are amongst the highest for a single SSD in our database, a higher performance is only possible with a RAID 0 configuration. 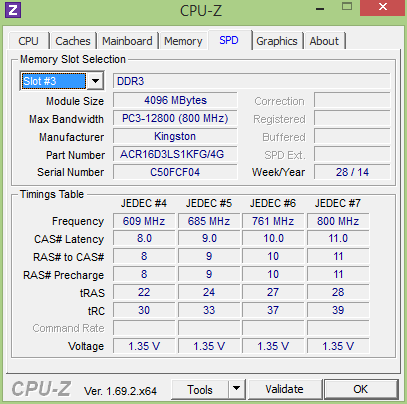 The Kingston RBU-SNS8100S3128GD can also secure a spot in the top third with regard to the reading of small distributed files (4K Read). The result of the 4K QD32 Read test, which reads small files as well, but with several threads simultaneously, is worse. This test is supposed to simulate application and operating system launches. In this case, the Kingston SSD falls behind drives like the Crucial M500, the Liteonit LMT-128M6M in the P37G v2 or the Samsung SSD 840 EVO, but it is not at the bottom of the list. 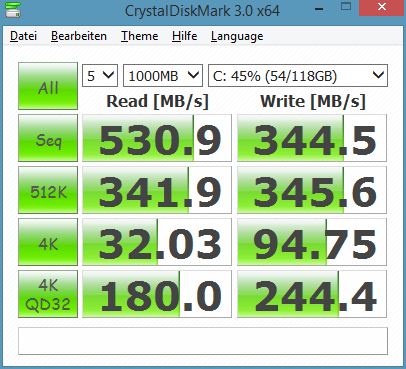 The dedicated SSD benchmark AS SSD supports these results. The far less important write performance (AS SSD Write score) is average. The additional conventional hard drive shows a very good performance in all disciplines as well. The Western Digital drive has a capacity of 1 TB and works with 5,400 revolutions per minute. 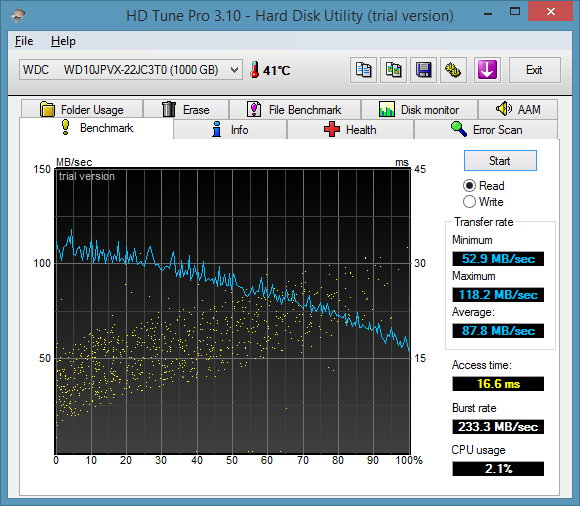 The SanDisk X110 in the Medion Erazer is beaten by our review unit. There are two versions of the DirectX 11 capable Nvidia GeForce GTX 860M: The older version with the Kepler GPU (GK104, 1,152 shader units, 797 MHz) and the much more efficient current version with the Maxwell chip (GM107, 640 shader units, 1,029 MHz + Turbo), which is used in the Acer Aspire V 17 Nitro Black Edition. It was able to maintain its maximum clock of 1,097 MHz in our tests. In terms of memory, you (only) get 2 GB GDDR5 RAM with an effective clock of 5,000 MHz, which is connected via 128-bit memory interface. This is a pity, since the chip supports up to 4 GB. The comparatively small memory equipment is currently only noticeable in the highest settings of some titles like Watch Dogs since the highest settings require 3 GB video memory, but it is not perfect for the future. Amongst others, the hardware video decoder supports 4k videos, but no HDMI 2.0. 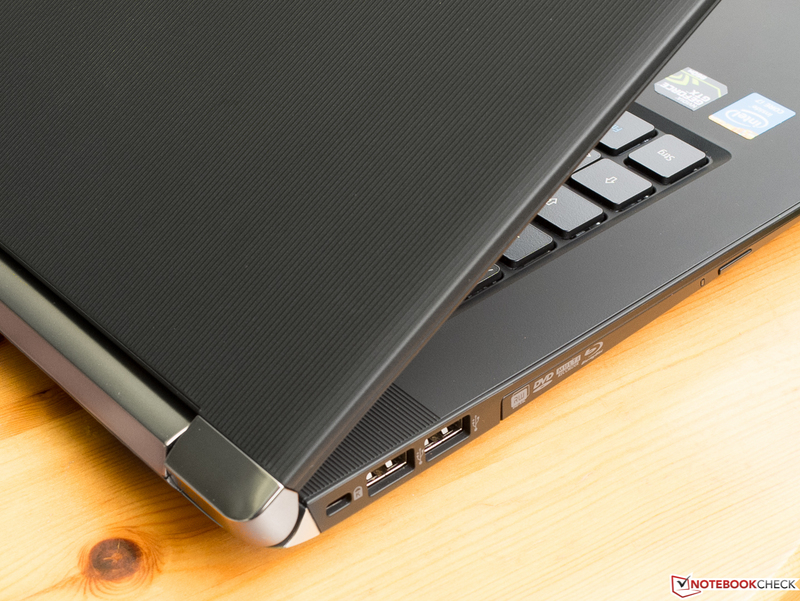 Because of the high power consumption of up to 60 Watts, the GTX 860M should be used in laptops with at least 15 inches. We look at the pure GPU benchmarks from the 3DMark (2013) and 3DMark 11 results since these tests are least affected by the CPU performance. The GTX 860M in our review sample performs on the expected level. The 7% deficit in the Cloud Gate test of the current 3DMark compared to the Asus G750JM-T4014H is within the normal fluctuation and is not important for daily work. This fact is supported by the even more demanding Fire Strike benchmark from the same suite, where the Asus manages a lead of 9%. Interesting is the 21% deficit (Cloud Gate: 26%) of the Medion Erazer X7613-MD98795, which can be explained with thermal issues due to the slimmer construction and/or the Kepler GPU. 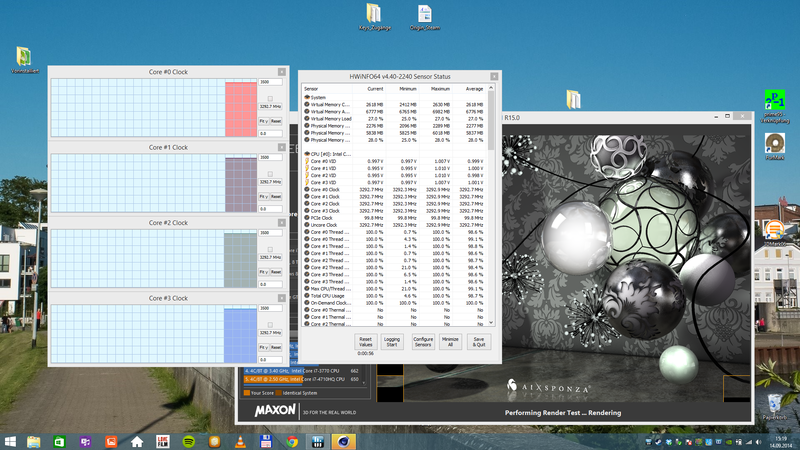 The older DirectX 11 benchmark 3DMark 11 shows a similar situation. 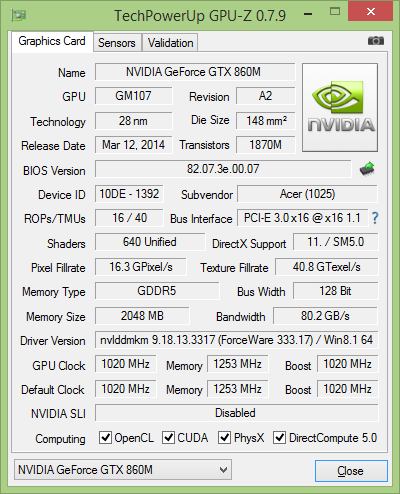 We can say that Acer managed to utilize the full performance of the GeForce GTX 860M. However, similar to the CPU, this is only true for mains power. 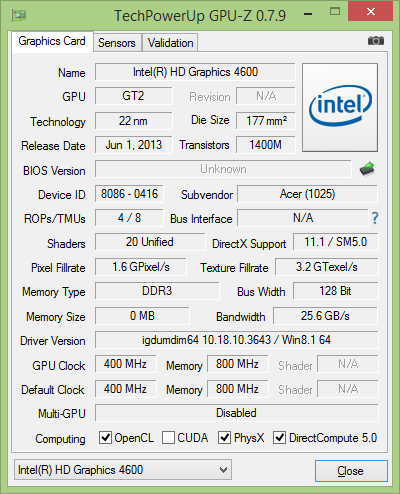 The screenshot shows that the GPU cannot maintain its maximum Turbo clock of 1,097 MHz on battery power. A repeated run of the Fire Strike benchmark on battery power only resulted in a 5% lower overall score, which includes the CPU performance as well. This is a surprisingly small difference and should be confirmed with a current game in the next section. 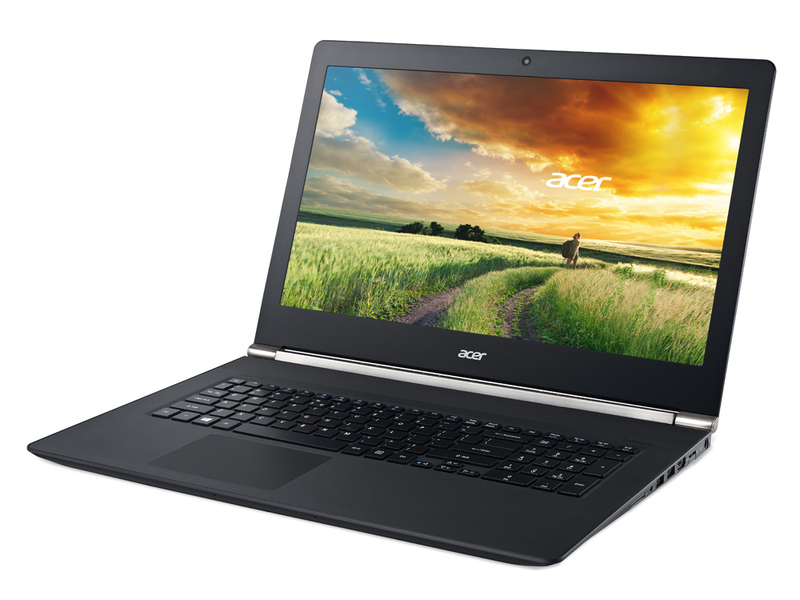 Our Acer Aspire VN7-791G-759Q manages frame rates above 40 in almost every tested game with high settings and a resolution of 1366x768 pixels, including very GPU-demanding titles like Crysis 3, Thief or Hitman: Absolution, but they are too much for the system in Full HD and the highest settings. If you only play older games like titles with the Unreal Engine 3 (Bioshock Infinite, Batman: Arkham Origins, Dishonored...), you can enjoy smooth gameplay in the highest preset. This would not be sufficient for gaming enthusiasts, they are probably going to buy a notebook with the Nvidia GeForce GTX 870M, the GeForce GTX 880M, which is currently the fastest single-GPU for notebooks or a Radeon R9 M290X. After the verdict section, is a benchmark comparison with some games, which includes notebooks with the faster alternatives as well. Compared to the Gigabyte P27G v2 with the identical GPU, our review unit is at least on the same level, while the older GTX 860M with a Kepler GPU in the Medion Erazer often has a noticeable shortfall, especially with high demands. The gaming performance is very limited on battery power. We compared the frame rates of Hitman: Absolution on mains and battery power as an example and measured 48 against 28 fps. 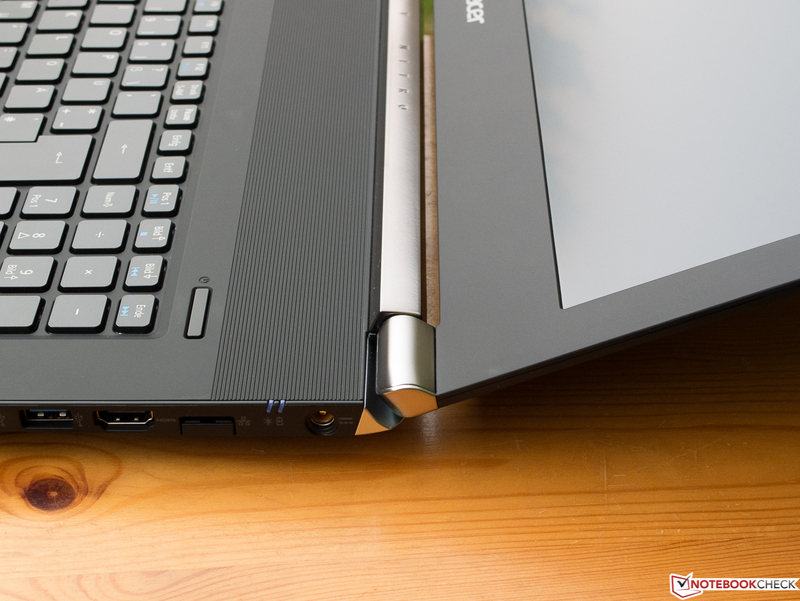 However, we do not think this is a big problem when you consider the limited mobility of the Acer Aspire Nitro V 17 Black Edition because of its size and weight. The usual ambient noise often means you will only hear the running CPU fan of the Acer Aspire V 17 Nitro Black Edition when you listen carefully. More load is compensated by the obviously effective passive cooling initially, because the fans do not react immediately to load changes and increase their speed in stages with smooth transitions. However, this also means that they run longer after you reduce the load to cool the components down. The fan does not have to run at the highest setting, even with complex games like Crysis 3, and even if it does, you can only hear a clearly audible murmur without annoying sounds, so it was hardly disturbing for the author. This impression is supported by the measurement results: The Nitro is much quieter than its rivals with medium workloads, and the difference increases to 7 dB(A) under maximum load. 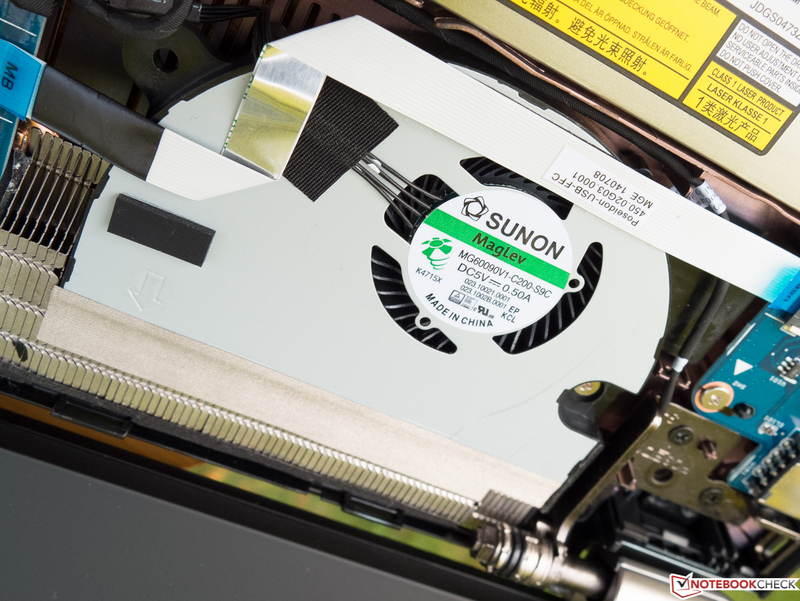 The very slim construction of the Medion Erazer X7613-MD98795 obviously takes its toll because the smaller fans and the higher cooling requirements result in a higher fan speed. 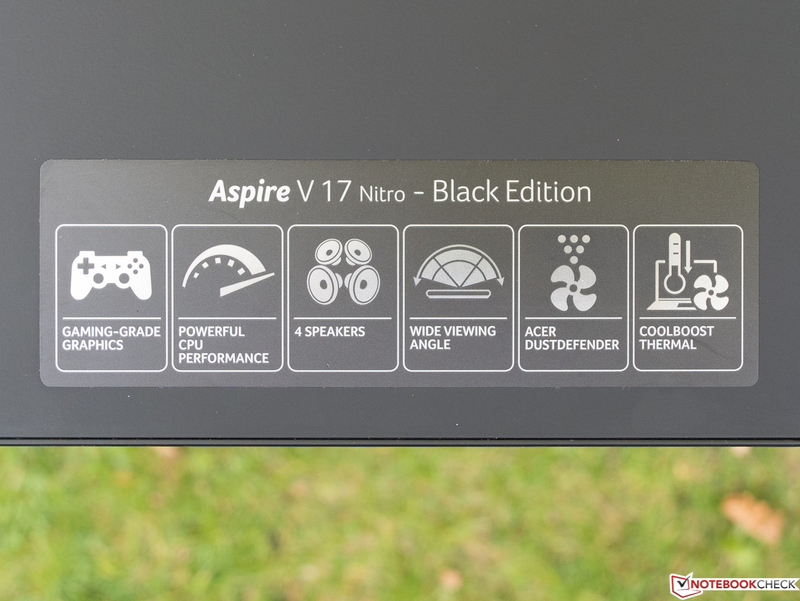 As well as the moderate temperatures (next section), the low system noise despite the maintenance of the maximum performance is one of the strengths of the sophisticated construction of the Aspire V 17 Nitro. No throttling, not even under maximum load for the CPU and GPU at the same time. We can measure a maximum temperature of an uncomfortable 55 °C (~131 °F) during gaming in some places, but who is going to play games with a 3 kg (~6.61 lb) notebook on their lap? 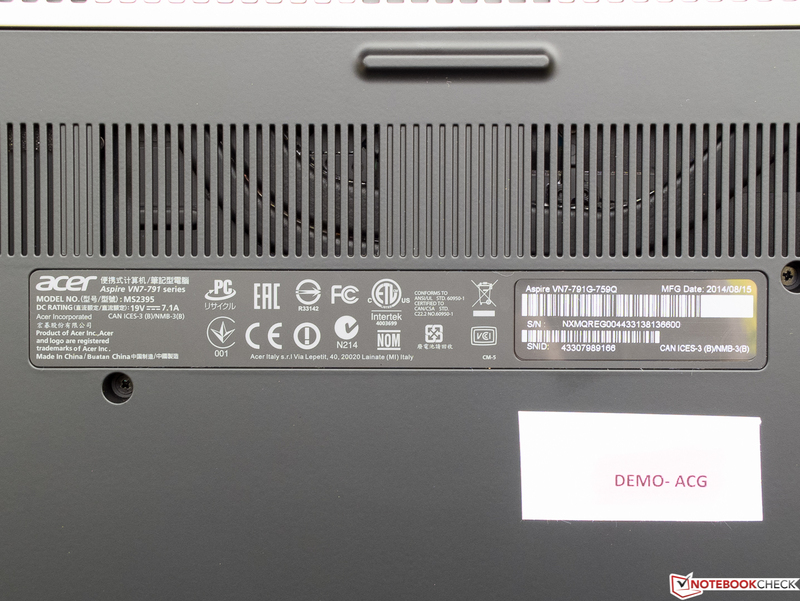 More important is the observation that Acer managed to keep the front areas that you touch regularly, below 30 °C (~86 °F) in every situation – great job. The P27G v2 never surpasses 50 °C (~122 °F) at any spot, while the Erazer reaches up to 68 °C (~154 °F!) at the bottom and up to 42 °C (~107.6 °F) at the palm rest. 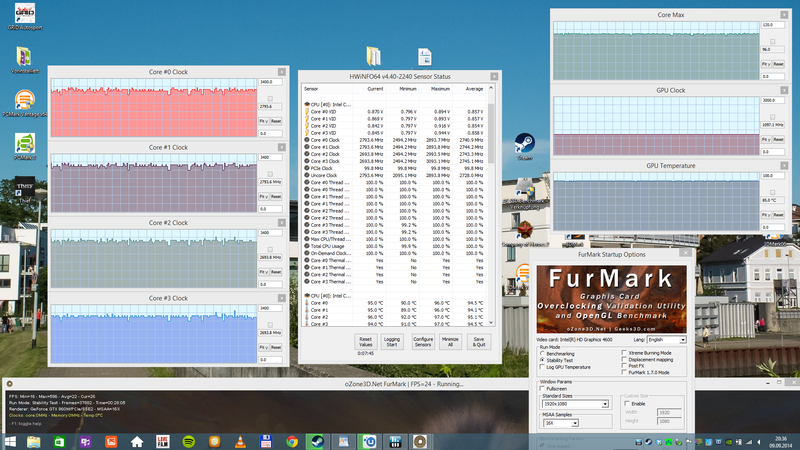 We could not determine any throttling during our stress test with Prime95 and FurMark. 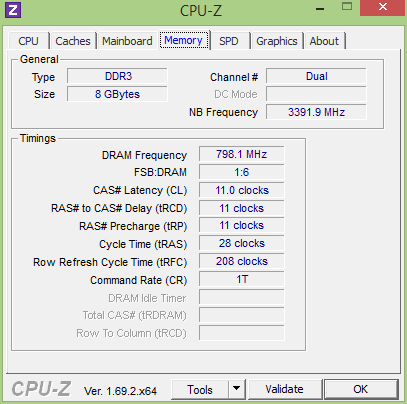 As you can see on the screenshot, the core clocks always stayed above the nominal clock of 2.5 GHz, while the graphics card was able to maintain its Turbo clock of 1,097 MHz all the time. 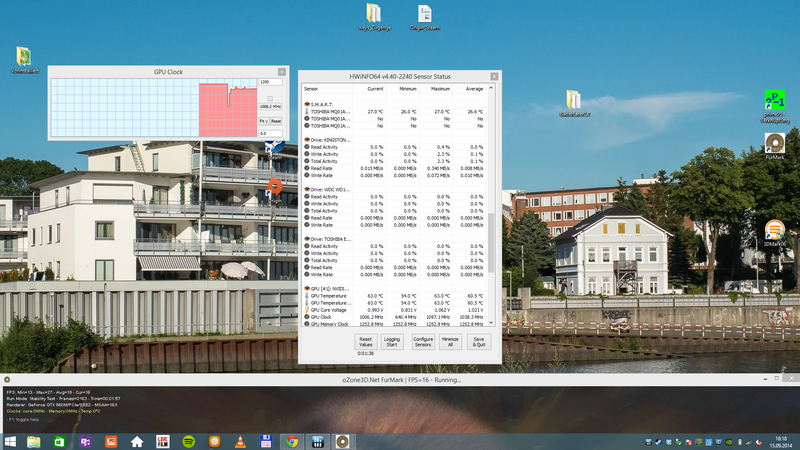 The maximum temperature of the CPU during this test was 96 °C (204.8 °F), the GPU leveled off at 85 °C (~185 °F). You can only adjust the equalizer when you listen to something, and the behavior is somewhat dynamic. We don't really know why. 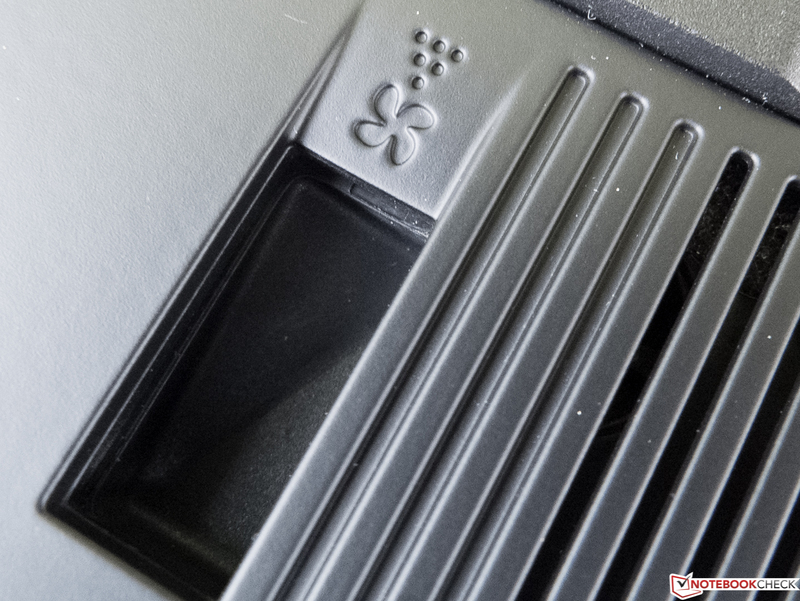 The sound system has four speakers according to the sticker from Acer, and the first thing you will notice is the very high maximum volume. If you select the music preset in the Dolby settings (picture) and put the device on a wooden table, you are confronted with a differentiated and somewhat dynamic and rich but unfortunately slightly hollow sound with emphasis on the medium tones without real bass. This means bass-heavy and rich music (examples: Alice in Chains: Choke, Municipal Waste: Sadistic Magician) is not really enjoyable, and it does not matter what preset you select. 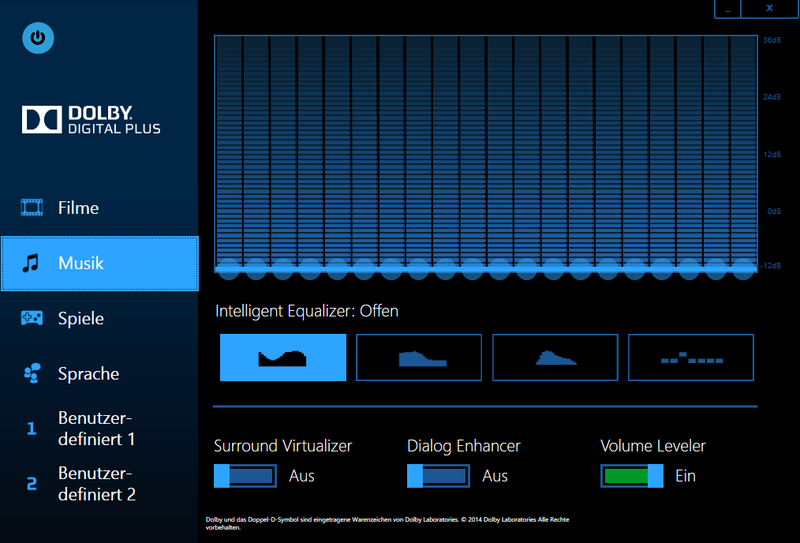 Tweaks like the Sound Virtualizer or the Volume Leveler cannot change the limitations; the latter feature can be used to limit the shrillness of some sources, which is then added by the Sound Virtualizer. Use a high volume, and you have to live with distortions, but no fluctuations in volume. Voices in movies were easy to understand, the sound during gaming was similar to music playback. Very busy scenes in shooters should only be listened to with a reduced volume. 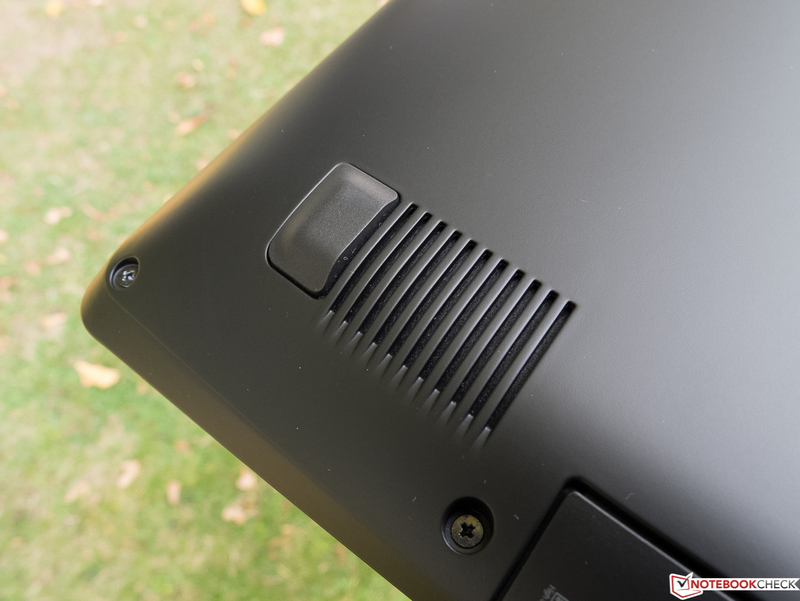 Similar to the majority of modern notebooks, the sound is good via external sound system, but it cannot compete with the dynamic or the sound quality of a dedicated X-Fi sound card from Creative. 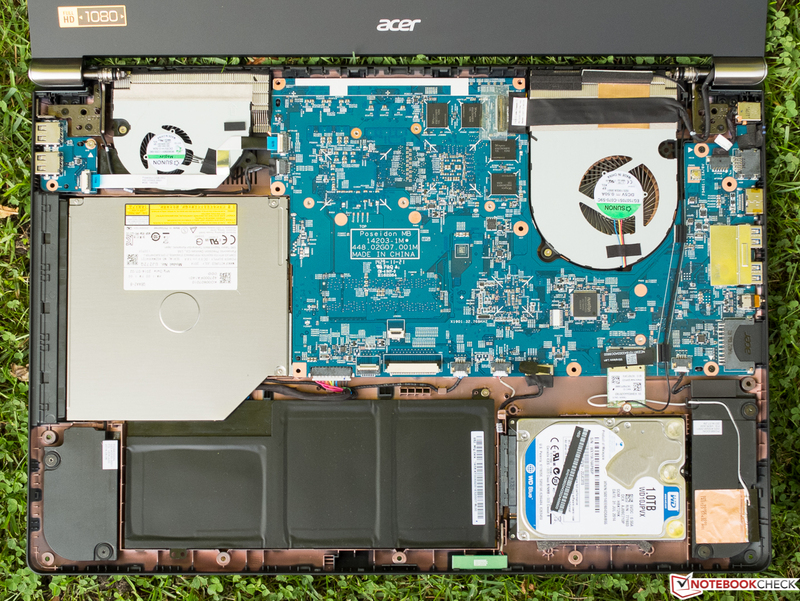 If you limit the power consumption comparison to gaming notebooks with a similar CPU and identical graphics card from the last twelve months, the review sample can manage a spot under the top three of the most frugal devices in every scenario. This is an impressive performance. The Nitro is also the winner compared to the other two comparison devices. The situation changes when we look at the battery runtimes: Because of the comparatively small battery with 52.5 Wh, the Aspire Nitro only managed a spot in the middle or the bottom. Gaming (to a certain extent) on the road is possible for one to two hours, the more realistic WLAN test with an adjusted brightness of 150 cd/m² and deactivated consumers like Bluetooth while a script refreshes websites periodically results in a runtime of 220 minutes (3:40 hrs), but the average result in this notebook class is 250 minutes (~ 4:10 hrs). Medion Erazer (63 Wh) and Gigabyte P27G v2 (77 Wh) are closer to that average result with 246 (~4:06 hrs) and 244 minutes (~4:04 hrs), respectively. If the Nitro has been designed with only gamers in mind, the battery probably should have been larger, but this also reduces height and weight in return. Acer does not offer any optional batteries, but you would have a hard time to integrate it anyway. 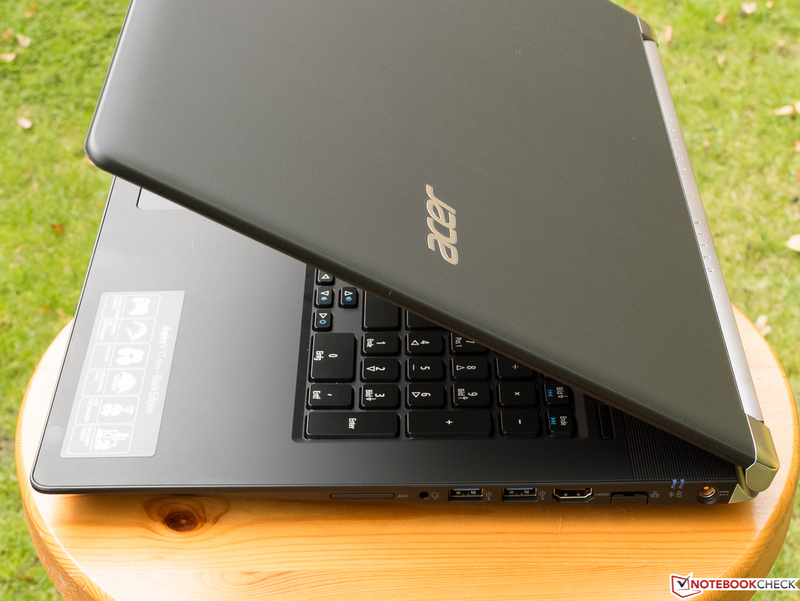 What a shame, we would have liked to see a very good rating for the Acer Aspire V 17 Nitro Black Edition (VN7-791G-759Q), but it just misses it (amongst others) because of the very complicated accessibility of the battery and the other components that could be maintained. This is a problem for a 17-inch gaming notebook in particular. The other drawbacks, like the slightly flexible keyboard and the not very impressive sound quality, on the other hand, are just minor issues. There are many positive aspects as well: The Nitro is as fast as the components can be, but it is also quiet and cool at the same time – this is not a matter of course when you consider the slim construction and the low weight. The Medion Erazer X7613-MD98795, for example, has more problems with the thermals despite the similar hardware components. You get a presentable case, with attention to details and the convenient functionality, such as great surfaces and nice visual design elements, which can be appealing. 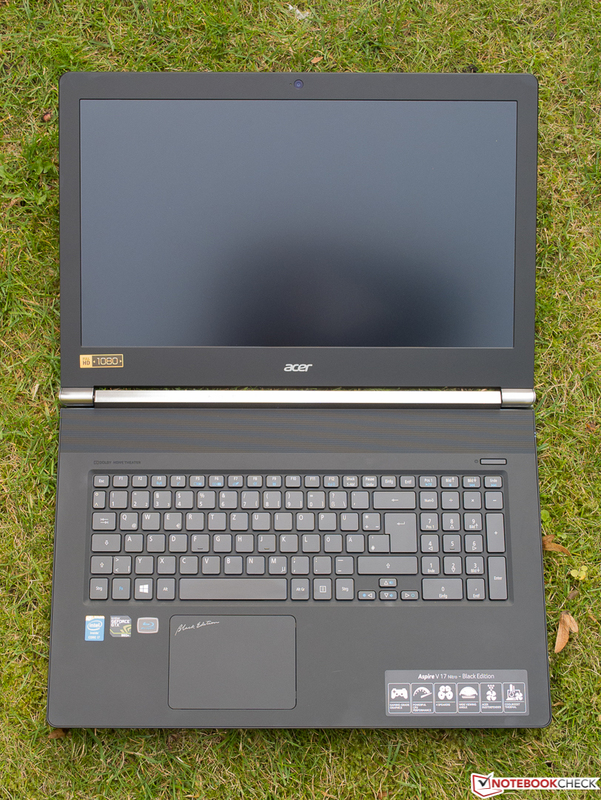 Last but not least, the Acer Aspire Nitro with its convenient input devices, the delay-free handling and the more than usable screen is well suited for the stationary use. 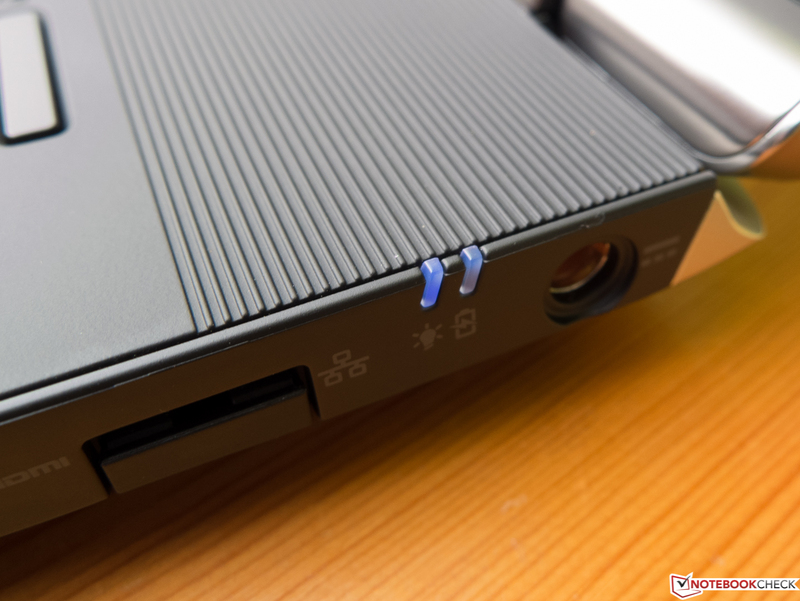 We can recommend the Acer Aspire Nitro V 17 Black Edition for gamers that can live with small restrictions in current blockbusters and demanding future titles that are ready to deal with the tricky maintainability, or visit a specialized dealer when they have any issues. We do not have any suitable alternatives, better or worse, for you anyway. ... between dark gray and black. ... so-called "soft-touch NIL" surface. The maximum opening angles is surprisingly big. ... and have an anti-sliding coating. 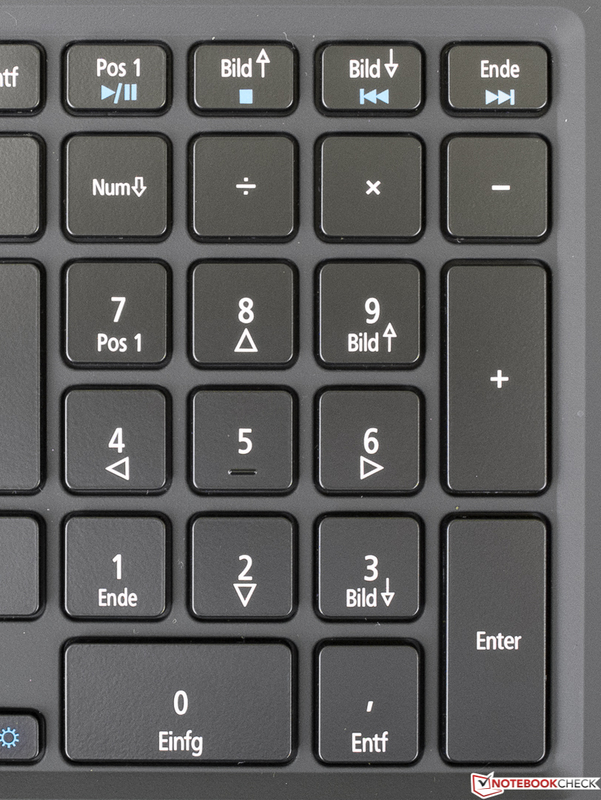 As it is often the case, the arrow keys are only half-sized. We really liked the touchpad. ... and you get the other stickers as well. 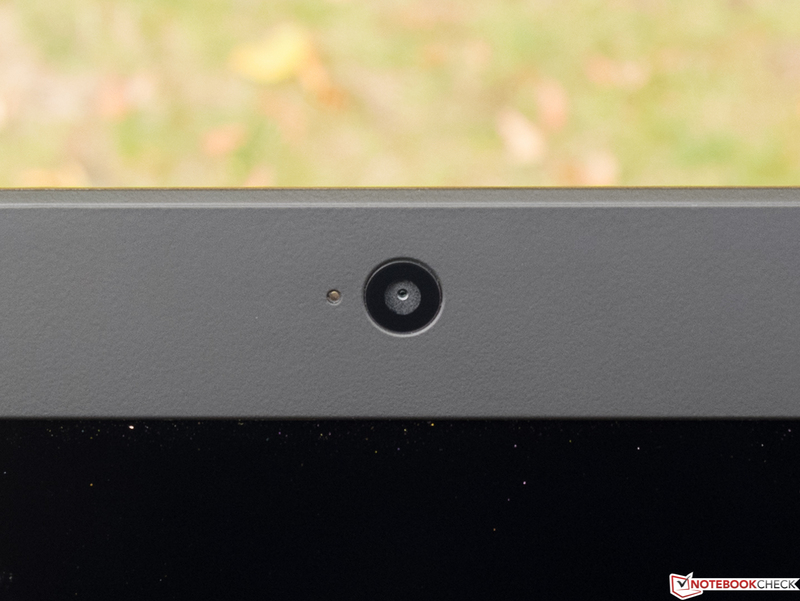 Webcam, the thing next to it looks like the ambient light sensor. Status LEDs with an unusual but clever position. Blu-ray burners get rare. If you need it, you get it. Dust that has been caught by the Dust Defender is supposed to be collected here. Acer manages the temperatures and the system noise perfectly despite the full performance. A maintenance cover and a replaceable battery! This great package is cheaper than competitors with more drawbacks.